Learn the differences between ABS Resin central vacuums (new video) and Metal central vacuum systems. Welcome to ThinkVacuums.com. Rust is one of the problems you may encounter when purchasing a metal central vacuum. These units are no less qualified when cleaning your home… though over time their durability is considered questionable. These units are susceptible to corrosion, denting, and are much heavier than some of the newer ABS resin made models. The choice is yours, but as experts we feel the lighter more durable, rust proof material of ABS resin is the direction central vacuum manufactures are heading. View some Central Vacuum Recommendations. Our service technicians just came back from a service call. Our customer was complaining of an electrical smell after seeing sparks / flames shooting out of her central vacuum system. We advised her before arriving to unplug it immediately. Sometimes we are able to save the central vacuum motor but more than often it is safer to replace the motor or complete central vacuum unit. We wound up installing a brand new DrainVac central vacuum system. The customer could not believe how much quieter and much more powerful her new vacuum was. She felt more comfortable to replace the system rather than repair the old one. The old system which she owned for over 15 years; a NuTone CV450 (no longer in production). We went into great detail on how energy efficient these units are… not only will she be saving on electricity bills but, she will be cleaning the house much faster and with less effort. Our customer initially complained that her original builder never gave her the option of selecting the central vacuum system herself. She felt that he just dumped the system because he got a good buy and claims it never really worked that good from the start. She was extremely pleased with our fast service and job well done. With the release of the new VX series Central Vacuum Systems by NuTone, owner of Think Vacuums informs inquiring customer of the features and benefits of the NuTone Power Units. Take a moment to watch the following video review explaining the advantages NuTone offers home and office owners. For additional product information contact us at 1.800.322.2965 or visit ThinkVacuums.com We are the vacuum experts with one of the largest selections of Central Vacuum Systems, Household Vacuums, Commercial and Backpack Vacuums including a complete variety of accessories and central vacuum attachments. 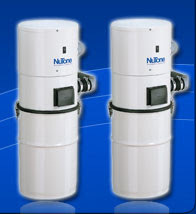 NuTone recently retired two of their older central vacuum systems; the CV353 and CV350. ThinkVacuums has sold thousands and thousands of the NuTone CV353 and CV350 but even good central vacuum systems come to an end. Because of their long running popularity we will continue to carry NuTone accessories, parts and offer service of these model. NuTone has been recognized as the #1 "Brand used in the Past 2 Years" and "Brand used the Most" for Central Vacuums according to a 2009 "Brand Used" study by Builder Magazine. Think Vacuum still offers the above mentioned products through our leading online central vacuum store. For more helpful information or to purchase the NuTone Central Vacuum Systems listed here visit our NuTone Central Vacuums page. Remaining quantities are limited to product availability.